Spring has sprung and we have plenty of charming cats and delightful dogs who are eager to hop into their forever homes! 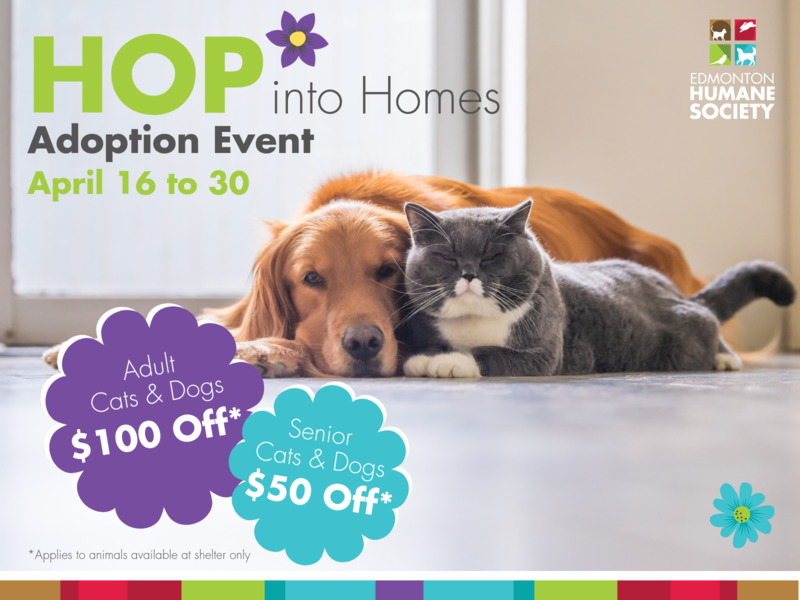 From April 16th to 30th, all adult (over 6 months) cat and dog adoption fees will be $100* off the regular price, and senior (7+ years) cat and dog adoption fees will be $50* off the regular price. There’s no better treat these adorable adoptables could find than a forever family! Come on by the Edmonton Humane Society and meet your next furry friend today. Before you commit to adopting an animal, make sure you’re prepared! Read through our adoption process here. *Special pricing only applies to animals at the Edmonton Humane Society. Does not include off-site adoption locations.